Would you rock the trend? Ma dai sono tornati di moda i baschi??? Sono molto chic e mi ricordano tanto i film degli anni 50! Wearing berets is so French chic. It looks good in any outfit. Happy Monday. Uno stile molto parigino... adorabile! UN ENCANTO...me han gustado todas!! te invito a pasar por mi blog..y a seguirnos! 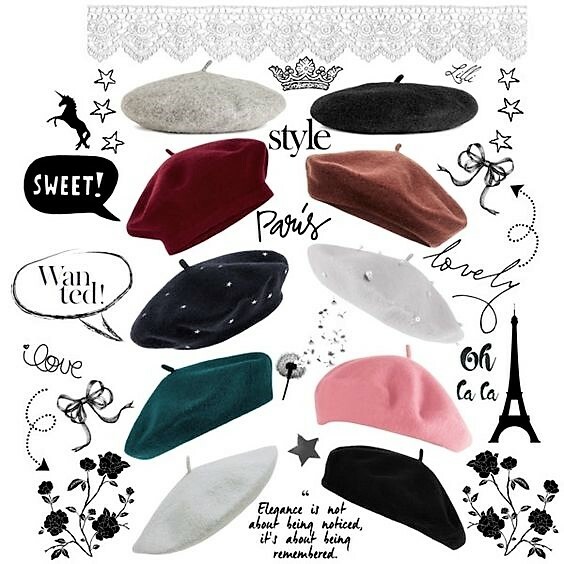 Berets are one of my favorite hat styles because they're just so classic and chic! One couldn't go wrong with any of these fabulous picks :) Happy new week Lilli! i can´t wait to see you with such a Beret. I´m such you will look amazing with it. One of my favorite Fall trend! I have a pair of berets in my possession but it is not too much to think about renewing with these models that present us today, although it will be for the next winter, I like the rose and the brown gives a French touch to your look! Kisses and happy week Lilli. Awesome tips to keep safe my hair. I beleive everybody need to use this cap and also use Liquid Matte Lipstick to keep your face beauty.